Bi Metal Thermostats, Circuit Breaker Thermostatic Bimetals, Circuit Breaker Thermostatic Trimetal, Trimetal Thermostatic, MCB Thermostatic Bimetals, MCB Thermostatic Trimetals, Thermostatic Bimetals, Thermostatic Trimetals, Electron Beam Welded Materials, Automotive Snap Action Discs, Automotive Application Components, Precision Rolled Stainless Steel, Copper Strips, Nickel Strips, Shunt Materials, Electron Beam Welded Precision Shunt Resistors, Shunt Resistors, Solder Reflow Materials for Car Defogger Terminals, Copper Alloy Strips, Nickel Alloy Strips, Electron Beam Welded Shunts for Electronic Energy Meters, Bimetal Thermostats as an active Manufacturer, Supplier, Dealer, Distributor, Trader and Seller etc. (*Importer/Exporter/Service Provider). 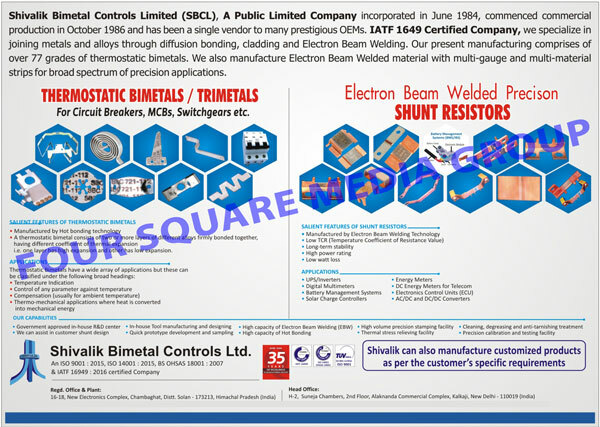 Since 1986, Shivalik has been a single vendor to many prestigious OEM's and has successfully met the most stringent demands of multiple global organizations. It specializes in joining materials through various techniques such as Diffusion Bonding/Cladding, Electron Beam Welding, Solder Reflow and Resistance Welding. The company has a worldwide sales network thus holds a wider reach in the global market as well.